I’m in the throes of designing a new help desk for our department that will serve to triage help tickets for approximately 15,000 employees. This has been a major undertaking, and retaining the confidence that I can get it done has been a major challenge. However, it’s also been a really great exercise in forcing me to be introspective about how I design my own ethics and culture into the system. When we design and build systems for ourselves, we design for what we need, and if you’re like me, you also aim to design for simplicity and the least work possible that still accomplishes your end goal. When I’m designing for myself, I find that I am more willing to let go of a feature I thought I needed because another one will do the job okay, and okay was enough, especially if it means less work for me. Designing for ourselves in a way is easier than designing for someone else. You essentially know what you need; there’s no guess work or communication gap. Yes, we can get caught up in semantics about how we may not actually understand what we need, and thus you may build something that doesn’t achieve the end goal you had. But hopefully, in the process, you evolve and learn to design and build what you really need. Also, designing for ourselves forces us to let go on the complex and unnecessary features and build a more simple product that will hopefully be easier to maintain over time. I do not know a time while working in libraries where we (library folk) were not hooting and hollering about the awfulness of the library technology ecosystem. As I mentioned, I’m in the depths of designing a new service desk for my team (in JIRA Service Desk), and I find myself asking “Do we REALLY need this? Can this complex setup be accomplished through a different, simpler method? Can we maximize the use of this setup and use it in more than just one functional way?” When I have to do all the legwork, I think more carefully about essentials and nice-to-haves than when we hired someone else and I was the “ideas person” – and probably much less flexible on the tedious items. The flip side to this is that maybe my intimate connection with the workload also encourages me to overlook and take shortcuts that seem fine but really ought to be examined carefully. What comes to mind is a presentation I refer to frequently: Andreas Orphanides’ Code4Lib 2016 talk Architecture is politics: The power and the perils of systems design. Design persuades; system design reflects the designer’s values and the cultural context [Lesson 2 in Andreas’ talk]. Fortunately for me, this came to light while I’m still in the middle of the design process. While not an ideal time because I’ve already done a lot of work, the opportunity to step back, adjust and try again sits in perfect reach. I’ve started reexamining our workflows, frontend and backend; it’s going to take more time, had I thought about the shortcuts I was making sooner and the impact they had on the user experience maybe I’d have less reexamining to do. When we design for ourselves, how often do we make a compromise on something because it makes the build easier? Does our desire to just get the job done cause us to drop features that might have made the design stronger, but leaving it out meant less work in the end? If someone else was building your design, would you demand that that feature be included – even though it’s difficult to do? Does our intimate connection with the system design encourage us to continue to build in poor values? Can we learn to be more empathetic  in our design process when we’re designing for ourselves? I hope I’ve encouraged you to consider what you may be missing when you design a system for yourself; what habits you’re creating that will be an influence when you design a system for another. Coloring was never my thing, even as a young child, the amount of decision required in coloring was actually stressful to me. Hence my skepticism of this zen adult coloring trend. I purchased a book and selected coloring tools about a year ago, coloring bits and pieces here and there but not really getting it. Until now. As I was coloring this particular piece [pictured to the left] I started seeing the connection the micro process of coloring has to the macro process of managing a library and/or team building. Each coloring piece has individual parts that contribute to forming the outline of full work of art. But it goes deeper than that. For exampled, how you color and organize the individual parts can determine how beautiful or harmonious the picture can be. You have so many different color options to choose from, to incorporate into your picture, some will work better than others. For example, did you know in color theory, orange and blue is a perfect color combination? “According to color theory, harmonious color combinations use any two colors opposite each other on the color wheel.”  But that the combination of orange, blue and yellow is not very harmonious? Our lack of knowledge is a significant hindrance for creating greatness, knowing your options while coloring is incredibly important. Your color selection will determine what experience one has when viewing the picture. Bland, chaotic or pleasing, each part working together, contributing to the bigger picture. “Observing the effects colors have on each other is the starting point for understanding the relativity of color. The relationship of values, saturations and the warmth or coolness of respective hues can cause noticeable differences in our perception of color.”  Color combinations, that may seem unfitting to you, may actually compliment each other. Note that some colors will be used more frequently and have a greater presence in the final product due to the qualities that color holds but remember that even the parts that only have a small presence are crucial to bringing the picture together in the end. There may be other times where you don’t use a certain color as much as it should have and could have been used. The picture ends up fully colored and completed but not nearly as beautiful (harmonious) as it could have been. When in the coloring process, ask yourself often “‘What else do we need to consider here?’ you allow perspectives not yet considered to be put on the table and evaluated.”  Constant evaluation of your process will lead to a better final piece. 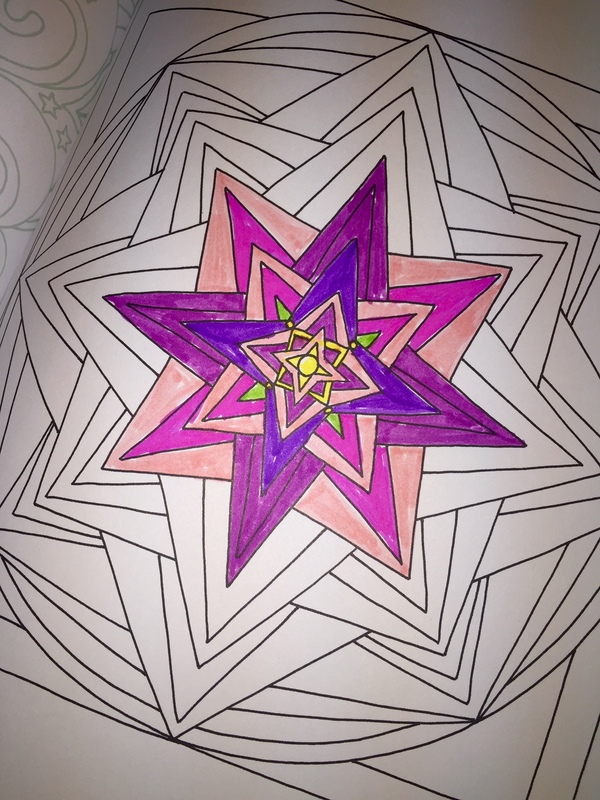 While coloring I also noticed that I color individual portions in a similar manner. 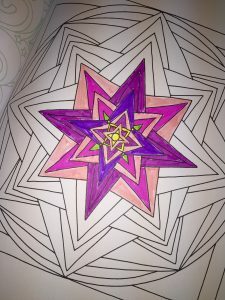 I color triangles and squares by outlining and shading inwards. I color circular shapes in a circular motion and shading outwards. While coloring, we find our way to be the most efficient but contained (within the lines) while simultaneously coordinating well with the other parts. Important to note, that the way you found to be efficient in one area may not work in another area and you need to adapt and be flexible and willing to try other ways. Imagine coloring a circle the way you color a square or a triangle. You can take as many shortcuts as you want to get the job done faster but you may regret them in the end. Cut carefully. Remember while coloring: Be flexible. Be adaptable. Be imperturbable. You can color how ever you see fit. You can choose which colors you want, the project will get done. You can be sure there will be moments of chaos, there will be moments that lack innovation. Experiment, try new things and the more you color the better you’ll get. However, coloring isn’t for everyone, at that’s okay. Now, go back and read again, this time substitute the word color for manage. Maybe there is something to be said about this trend of the adult coloring book. I’m a Librarian. Of tech, not books. When someone finds out I’m a librarian, they automatically think I know everything there is to know about, well, books. The thing is, I don’t. I got into libraries because of the technology. My career in libraries started with the take off, a supposed library replacement, of ebooks. Factor in the Google “scare” and librar*s were going to be done forever. Librar*s were frantic to debunk that they were no longer going to be useful, insert perfect time and opportunity to join libraries and technology. I maintain the system the library sits on, the one that gives you access to the collection from your computer in the comfort of your home. This tool, that lets you view the collection online and borrow books and access databases and all sorts of resources from your pajamas, my job is to make sure that keeps running the way we need it to so you have the access you want. My response aims to give a physical picture about a technical thing. There is so much we do as systems librarians that if I were to get in-deep with what I do, we’d be there for a while. Between you and I, I don’t care to talk *that* much, but maybe I should. There’s a lot more to being a Systems Librarian, much of which is unspoken and you don’t know about it until you’re in the throws of being a systems librarian. There was a Twitter conversation prompted when a Twitter’er asked for recommendations on things to teach or include in on the job training for someone who is interested in library systems. It got me thinking, because I knew little to nothing about being a Systems Librarian and just happened upon it (Systems Librarianship) because the job description sounded really interesting and I was already a little bit qualified. It also allowed me to build a skill set that provided me a gateway out of libraries if and when the time arrived. Looking back, I wonder what would I have wanted to know before going into Systems, and most importantly, would it have changed my decision to do so, or rather, to stay? So what is it to be a Systems Librarian? is an imperfect person that maintains an imperfect system so that multiple departments doing multiple tasks can do their daily work. Things I would have wanted to know about Systems Librarianship: When you’re interested but naive about what it takes. 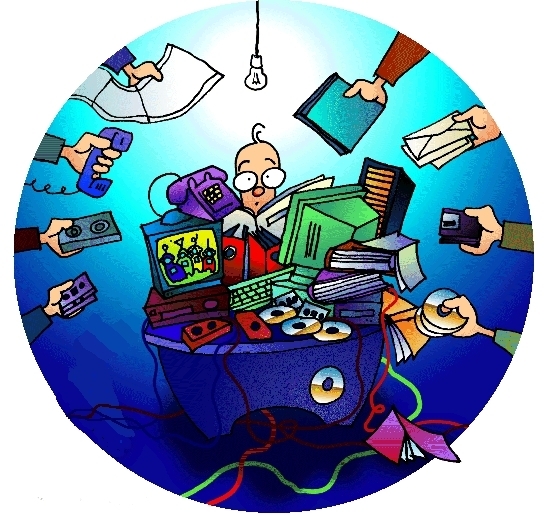 Systems Librarianship requires you to communicate, often and on difficult to explain topics. Take time to master this. You will be doing a lot of it and you want everyone involved to understand, because all parties will most likely be affected by the decision. You don’t actually get to sit behind a computer all day every day just doing your thing. You are the person to bridge the gap between IT and librarians. Take the time to understand the inner workings of both groups, especially as they relate to the library. You’ll be expected to communicate between IT staff and Library staff why their request, no matter the intention, will or will not work AND if it will work, but would make things worse – why. You need to understand the tasks of every department in the library. Take the time to get to know the staff of those departments as well – it will give insight to how people work. You need to be able to say no to a request that should not or cannot be done, yes even to administration. No one really knows all you do, so it’s important to take the time to explain your process when the time calls for it. You’ll most likely inherit a system setup that is confusing at best. It’s your job to keep it going, make it better even. You’ll be expected to make the “magic” happen, so you’ll need to be able to explain why things take time and don’t appear like a rabbit out of a hat. You’ll benefit greatly from being open about how the system works and how one department’s requests can dramatically, or not so dramatically, affect another part of the system. Be honest when you give timelines. If you think the job will take 2 weeks, give yourself 3. You will spend a lot of time working with vendors. Don’t take their word for “it,” whatever “it” happens to be. This is important– you’re not alone. Ask questions on the email lists, chat groups, Twitter, etc..
You will be tempted to work on that problem after work, schedule time after work to work on it but do not let it take over your life, make sure you find your home/work life balance. Being a systems librarian is hard work. It’s not always an appreciated job but it’s necessary and in the end, knowing everything I do, I’d choose it again. Being a tech librarian is awesome and you don’t have to know everything about books to be good at it. I finally accepted this after months of ridicule from my trivia team for “failing” at librarianship because I didn’t know the answer to that obscure book reference from an author 65 years ago. Also, those lists are not, by any means, complete — I’m curious, what would you add?